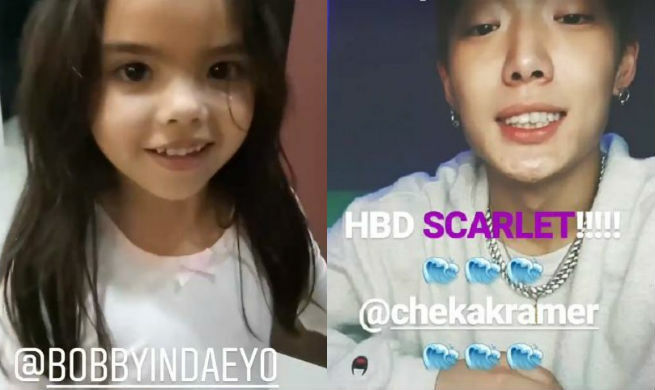 It was a surreal moment for Doug and Cheska Kramer’s adorable daughter Scarlet after getting her birthday wish, a greeting from Bobby of the K-Pop group iKon. In an Instagram post, Scarlet’s mom and dad shared the video greeting of Bobby for Scarlet which he posted on his Instagram stories. Cheska wrote: “Oh my gosh!!! Thank you @bobbyindaeyo for the early birthday greeting!!! Scarlett is in shock!!! Super means a lot to Scarlett, Kendra and Gavin!!! Thank you to our Team Kramer friends for helping us!!! Oh my gosh!!! Such supportive Team Kramer friends!!! You guys made it happen!!! Thank you DK @_dong_ii for greeting Scarlett too!! !